The original release of Peggle has been removed from the New Zealand App Store in favor of a new free-to-play version. Update: Electronic Arts says the free-to-play version of Peggle is merely a "test," something it does from time to time to gauge interest in new ideas. "We're exploring different ways to extend the fun of Peggle on mobile, and we're currently testing a free-to-play version of the game in Singapore and New Zealand," Public Relations Manager Lauren Svensson explained. "It's important to note that we haven't finalized gameplay features or business model yet, and this free-to-play version of Peggle is part of a series of tests we'll be conducting in specific markets. We often test these experiences first to see if they resonate with our players." Svensson said that the primary objective in this instance is to analyze the change in orientation from landscape to portrait as well as new gameplay ideas. "We're not soft launching a new product at this stage; we're simply testing some feature ideas," she said. She also pointed out that gamers who own the paid version of Peggle will always have access to it via their App Store purchase history. Electronic Arts appears to be taking another big step into the free-to-play milieu with the soft launch of an updated version of Peggle on the New Zealand App Store. The description of the game says it contains ten fewer levels than the original - 45 instead of 55 - and offers in-app purchases. 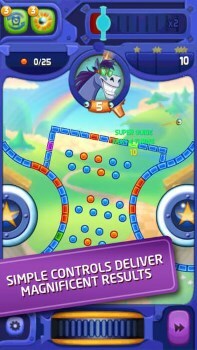 The screens also look different, indicating that Peggle F2P is played in portrait instead of landscape, and progress is apparently made "through thrilling and imaginative worlds" on a map screen very reminiscent of Candy Crush Saga. But the real surprise is that the free-to-play version of Peggle appears not to be joining the original release but replacing it, as the 99 cent paid game is no longer available on the New Zealand store. The App Store in other regions continues to offer the original and not the free-to-play release. My account is tied into the Canadian App Store so I can't check out this new version for myself but according to Pocket Gamer, the in-app purchases include power-ups like exploding balls and the ability to buy more balls when you run out. The new version also features an energy system common in free-to-play games which gives players the option of waiting for it to "recharge" between play sessions or paying in order to continue playing immediately after it runs out. We've reached out to PopCap for more information and will update if and when we receive a response; in the meantime, you can compare the free-to-play Peggle on the New Zealand App Store with the original release that remains available in North America.